If spaghetti squash is not your favourite vegetable, don’t give up on it quite yet. Both Nikki and I didn’t really care for it either. Until we made this Greek inspired dish. This is a healthy spin on a meal we enjoyed while visiting the island of Crete. 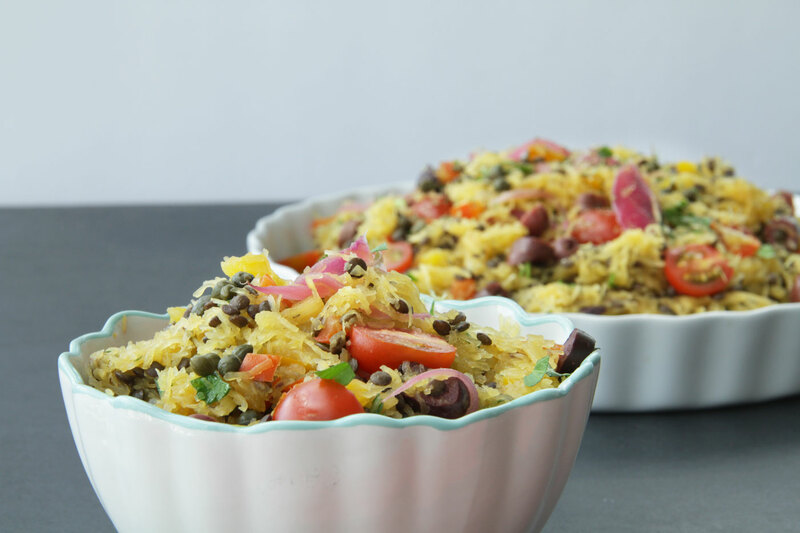 Traditionally made with pasta, this gluten free variation uses Spaghetti Squash instead of noodles. Mediterranean style herbs, caramelized onions and good quality olives make this an amazingly flavourful meal. 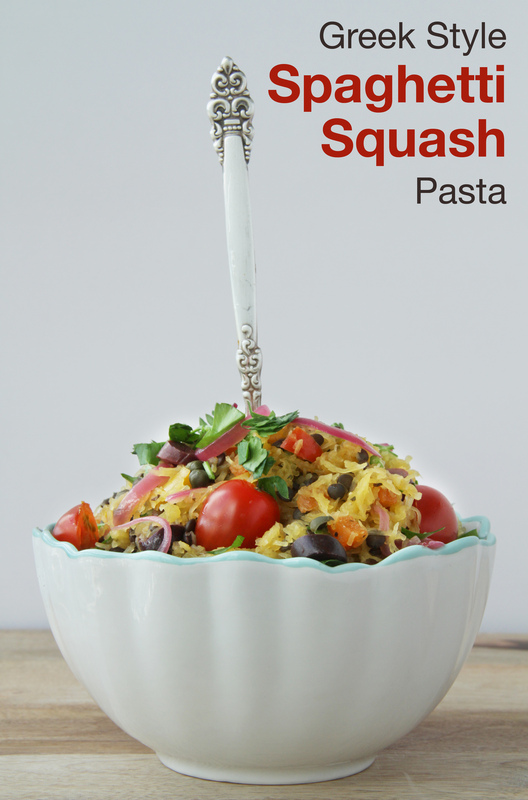 SPAGHETTI SQUASH – It is the ideal substitute for pasta thanks to its low carbohydrate and calorie count. 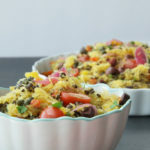 Spaghetti squash also contains omega-3 essential fatty acids and omega-6 fatty acids. While omega-3 fatty acids help prevent heart diseases, inflammation and different types of cancers, omega-6 fatty acids are ideal for promoting proper brain function. GREEN LENTILS – Lentils are loved by vegetarians and vegans because they’re a great and inexpensive high-protein food, rich in nutrients, high in fiber but low in calories, which helps make you feel full longer and less likely to snack throughout the day or overeat. BLACK OLIVES – Black olives are a great source of vitamin E, which has the brilliant ability to neutralize free radicals in body fat. Eating black olives in moderation will help support the immune system function and protect the body’s cells, particularly those of the brain, lung and red blood cells, from damage. Preheat oven to 350°F. Cut spaghetti squash in half (lengthwise). Scrape out and discard seeds and membranes. Place halves, cut side down, in a large baking dish; add water. Bake at 350°F for 45 to 50 minutes or until tender. If using dry lentils, rinse them well and cook in 1 cup of water for 20 to 30 minutes, Adding more water as needed to make sure the lentils are just barely covered. Once tender and no longer crunchy, turn heat off and set aside. Remove squash from the oven. Turn cut side up; cool for 10 minutes. 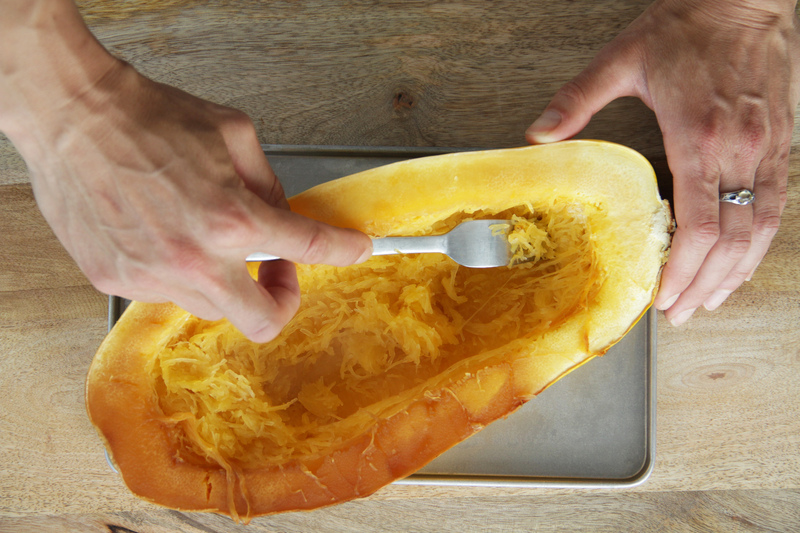 Using a fork, scrape out the spaghetti squash strands. If your squash is very moist, you might have to place the strands in a colander and pat with paper towel. Place squash's spaghetti into a large glass bowl. Gently mix in lentils. Heat oil in a medium skillet over medium-high. Add onion and garlic; sauté 4 minutes. Add apple cider vinegar, cook for 5 more minutes, until onions are nicely browned. Turn heat down to low/medium and mix in peppers, Mediterranean herbs and sea salt. Cook another 4 mins before gently mixing into a bowl with squash and lentils. Toss in cherry tomatoes, parsley olives and caper. Sprinkle with fresh ground pepper and serve. Use any leftovers for an easy "pack and go" lunch during your workday.